We are very excited to begin Spring with a vibrant new exhibition lead by printmaker Charlotte Cornish. Visit the gallery to see new work by our talented painters, printmakers, ceramicists and glassmakers. We hope to energise you in the new season! on 27th April between 2.30pm and 4.30 pm. This is a free event, we kindly ask you to register here. 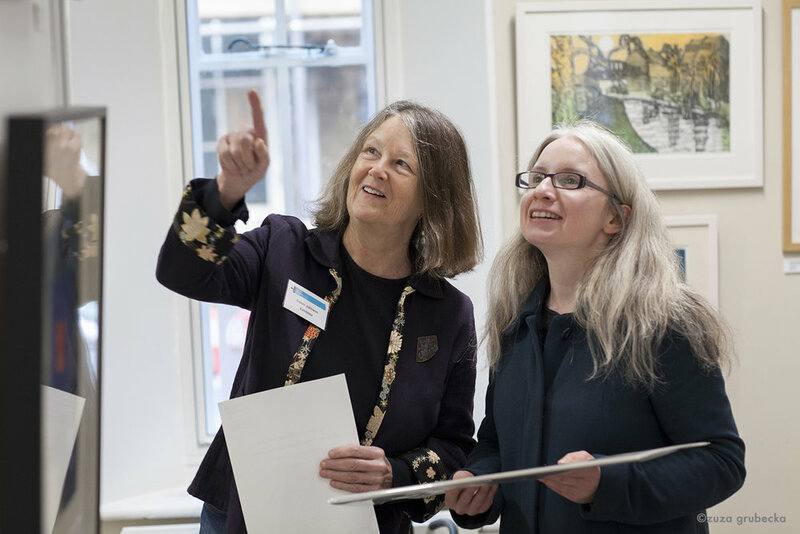 Cambridge Original Printmakers Biennale last autumn was a very successful exhibition showcasing the best printmakers from Cambridgeshire. We were kindly asked to choose The Best Print in Show and Conni Johnson along with Terry Bryan were the winners of the cambridge contemporary art prize. We are very pleased to show Conni's work during our Spring Exhibition. Sue Jones is an Artist, Printmaker, Tutor, Consultant, and founding organiser of the Cambridge Original Printmakers Biennale. Sue's abstract prints are inspired by landscape and are infused with a sense of mystery, vitality, colour and space. The Monotypes, are unique, evolved over time, constructed of many layers. Tracey Ashman has been printmaking for a decade and has a passion for the process, which she finds can be very exacting and challenging. Tracey finds that printmaking offers limitless creativity, in techniques that can be combined. Her preferred printmaking processes are mono-prints, silkscreen and linocuts. cambridge contemporary art has been representing ceramic work by Jane Hollidge for over 20 years. We are very happy to announce that we will also be showing Jane's new paintings during our Spring Show. The greatest impact on Jane's work was living in Asia. The wonderful simplicity and discipline of the art and culture there is seen in the way even the most humble objects are arranged. We are really excited to exhibit new work by painter Emily Powell, sculptor Scott Irvine, ceramicists Ann-Marie Magson, Silvia K, Lara Scobie, Peter Arscott, Sarah Hillman, Alison Graham, Ann Lee, Laura De Benedetti and glass by Ruth Shelley. 12 June - 2 September - Mixed Summer Show featuring David Hunt, Catriona Millar, Graham Rider, Emily Stevens, Elisa Lafuente, Richard Allen, Janine Baldwin, Emily Powell, Jeni Cator, Stacey Manser Knight, Simon Turner and many more.